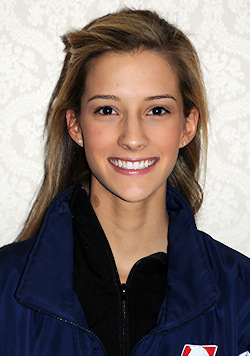 The gold medalist at the SBS ISU Junior Grand Prix (JGP) of Figure Skating Final for the 2008-09 season was USA’s Becky Bereswill, who is also a champion distance runner. The 18-year-old had qualified for the Final by winning silver medals at the JGPs in Spain and France, but was the sixth-ranked skater coming into the event. Only fourth after the short program, Bereswill scored almost 15 points above her previous best (83.24) to set a new personal best overall with 98.01 for the free skate and 146.69 total points. Bereswill’s long program contains a triple flip-double toe-double loop, double Axel-triple toe loop, and triple loop-double loop combination jumps. Her solo jumps are a double Axel, triple loop, triple Lutz, and triple toe loop. In the short program, her elements include a triple flip-double toe loop, triple Lutz and double Axel. Phillip Mills with assistance from Marina Zueva, choreographed her free program to Puccini’s Nessum Dorma from the opera Turandot, while Igor Shpilband choreographed her short program to Carousel Waltz by Richard Rogers and Oscar Hammerstein. Bereswill actually studied ballet with the Houston Ballet from when she was four until 13, and appeared in the annual production of The Nutcracker. Bereswill also played the violin when she was younger. “I think it helped me to understand music and rhythm at a young age and that helped my skating,” she said. The willowy blond, who skates in senior ladies at U.S. Nationals, was a late bloomer, never making it past Sectionals until 2008. Last year, she was tenth in seniors at nationals. Tall enough to be a dancer, Bereswill has taken her bronze dance tests but not competed in dance. “I wanted to improve my skating skills for my singles skating,” she explained. Megan Faulkner has been Bereswill’s primary coach for ten years although she also works with Mark Janoschak one day a week. She usually practices on ice for three hours a day, six days a week with another hour of off ice work. Not that she needs to run too much more. Bereswill competes in track and cross country races for Episcopal High School, where she is a senior honor student. She medaled at the conference championships in 2007 in the half mile. Last year, Her 4×800-meter relay team won the high school division gold medal at the Texas Relays, setting a school record pace. Her team has won the conference championship two years in a row. She has applied to several universities, where she plans to study economics for a possible career in international business. “I plan to continue skating as long as I can and stay involved in the sport after that,” she said. Bereswill also assists her mother, a former collegiate gymnast, in coaching gymnastics classes and Learn-to-Skate classes. She has also judged Basic Skills events at the Houston Fall Invitational.